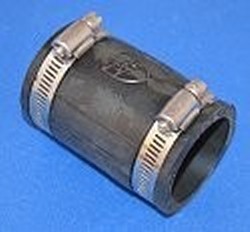 1.00" Flexible Rubber Fernco Couple for Cast Iron, Plastic, Copper, Steel or Lead to Cast Iron, Plastic, Copper, Steel or Lead. ID of each end is 1.3" to go over the pipe. Stainless band clamp on each end. Furnco (sometimes these are gray or black).